Timberline’s exploration efforts have been focused at its 23 square-mile Eureka land package, one of the largest remaining undeveloped gold properties in Nevada. Eureka is located on the south end of Nevada’s Battle Mountain / Eureka Trend, just four miles from the five-million ounce Archimedes / Ruby Hill mine. It includes Timberline’s Lookout Mountain project along with a pipeline of earlier-stage projects that feature past gold production, historic gold estimates, and/or drill-indicated gold mineralization. Timberline acquired the Eureka property, including Lookout Mountain, in its 2010 acquisition of Staccato Gold. 0.006 opt (0.21 g/t) cut-off applied to oxidized material to capture mineralization potentially available to open pit extraction and heap leach processing. 0.030 opt (1.03 g/t) cut-off applied to unoxidized material to capture mineralization potentially available to open pit extraction and lower heap leach recoveries or sulfide processing. Rounding may cause apparent discrepancies. 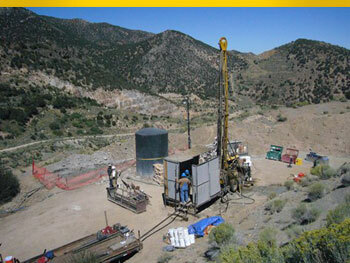 The effective date of the Lookout Mountain updated gold resources is February 20, 2013. Mineralized drill intercepts from outside the defined resource zone provide strong indications that step-out drilling along strike may significantly expand the gold resource. Timberline also expects to define heap-leachable gold mineralization at other project areas along three extensive north-south trends within the Eureka property. The western-most Lookout Mountain Structural Trend has been Timberline’s exploration focus since acquiring Eureka in 2010. It includes the South Adit, Pinnacle Peak, and Rocky Canyon areas and has excellent potential to expand the gold resource at Lookout Mountain. The central Oswego Structural Trend has seen relatively little exploration activity, but soil and rock geochemical sampling has demonstrated broad zones of anomalous gold mineralization over a 2.5 to 3 mile (4.5 to 4.8 kilometre) strike length. The eastern-most Windfall Structural Trend includes historic, non-compliant, gold mineral estimates and has a gold production history exceeding 100,000 ounces across several zones. The Windfall zone has significant exploration potential, particularly at Hoosac and Hamburg Ridge. Initial exploration targets at Windfall are based on a data package acquired by Timberline that includes all historic drill data, assays, and logs completed from the late-1960s to 1988 when gold was last produced there. In addition to historic drilling, twenty-six drill holes have been completed by Staccato Gold and Timberline, providing up to 700 feet of down dip controls on geology and mineralization. Deeper drilling on the Windfall patents has been limited to twelve to fourteen widely spaced holes. Timberline is continuing its exploration efforts at other Eureka locations with mapping and geochemical and alteration modeling in order to target deeper high-grade mineralization. The Company has also completed a large-scale magnetic survey to aid in exploration and drill hole targeting throughout the district. Management believes that Eureka has excellent potential to host a major gold-producing district. The Lookout Mountain mineral resources were modeled and estimated by MDA by evaluating the drill data statistically, utilizing geologic interpretations provided by Timberline to interpret gold mineral domains on cross sections spaced at 50- to 100-foot intervals across the extents of the Lookout Mountain mineralization, rectifying the mineral-domain interpretations on level plans spaced at 10-foot intervals, analyzing the modeled mineralization geostatistically to aid in the establishment of estimation parameters, and interpolating grades into a three-dimensional block model. Mike Gustin is a Qualified Person as defined by National Instrument 43-101 and is responsible for the resource estimate. The effective date of the Lookout Mountain resource estimate is February 20, 2013.